The name Ostrya carpinifolia derives from the Greek word, ostrua meaning bone-like, this refers to the hard timber of this wonderful ornamental tree. The attractive green leaves that appear in the spring adopt a buttery yellow shade in the autumn, providing additional seasonal interest. This slightly rounded tree also produces a mass of yellow/green catkins in the spring that forming a lovely, bright display. Growing to 8 x 4 metres in 20 years, this tree will do well in most well-drained soils in full sun or part shade. 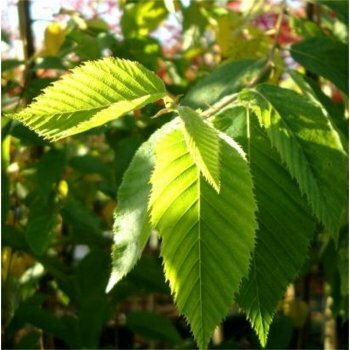 Our pot grown Hop Hornbeam trees can be planted at any time of the year. Prepare your planting site by removing weeds and grass within a metre of your desired planting hole. Dig a square hole as deep as your root mass and approximately 2x as wide. To help your tree establish more effectively, we advise applying Mycorrhizal root grow by sprinkling it in the hole. Gently loosen the roots and place into the planting hole. Mix 50% of the original soil with 50% high quality compost, fill in the hole and firm around gently. Take care to avoid banking soil up around the collar of the tree. We recommend planting Hop Hornbeam trees with a stake and tie. To see how to use a tree stake and tie, watch our informational how to videos. If you’re planting Hop Hornbeam in spring or summer water well and regularly for the first few months. Keep an eye on young trees and increase watering if there are extended periods of hot or dry weather. If you’re planting in autumn, you may only need to water your tree a little. We also stock a range of irrigation kits, suitable for a variety of planting schemes. Once planted, it is important to keep the area free of competing weeds and grass for the first couple of growing seasons. Installing mulch matting will aid in this. Do not simply mow the grass around the area as this will only encourage it to grow more vigorously. If you know your area is prone to rabbits, we would advise using a rabbit guard. Hop-hornbeam trees do not require regular pruning. If you wish to tidy up your Ostrya Carpinifolia tree, do this during the dormant season. Focus on removing any damaged, diseased or overcrowded branches. If you require a clear trunk, remove any side shoots to help raise the crown.